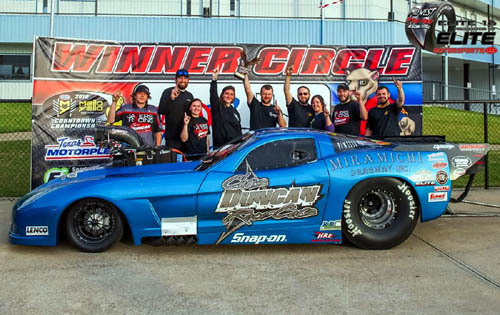 ENNIS, Texas -- The biggest single-event paycheck in eighth-mile Pro Mod racing history was made out to Randy Merick Nov. 3, after the Missouri-based driver outlasted a star-studded field in the inaugural Elite 16 event presented by Elite Motorsports and the Mid-West Pro Mod Series (MWPMS). 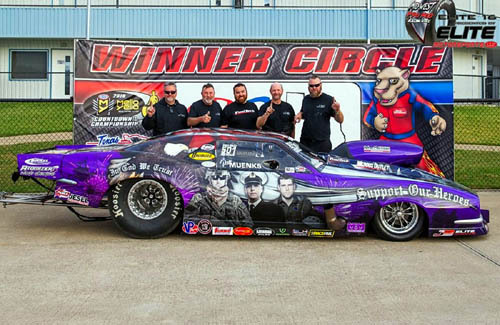 Merick qualified his supercharged, Larry Jeffers-built '79 Corvette fourth before making it past three-time NHRA Pro Mod champ Rickie Smith, former ADRL Pro Extreme champion Frankie Taylor and NHRA Pro Mod winner Joe Baker. He then outran former U.S. Nationals winner Eric Dillard in the $50,000-to-win final at the famed Texas Motorplex, near Dallas. "There were no easy ones, that's for sure, but I felt pretty good about my car going into this, even though it was just the fifth race on it since we brought it out in May. I just really felt like we had a good chance of winning," Merick said. "And this was the right one to win. "But really, my crew chief, Ed Briggs, Todd Tutterow, Larry Jeffers, they're the ones that made it happen. I'm just the guy that gets to ride in the car," he added. "The easiest person on a race car team to replace is the driver. A lot of them don't wanna' tell you that, but it's the truth. There are a lot of people out there in the world who can drive these kind of race cars, but there's really not that many who are smart enough to make them go down the track." The brainchild of MWPMS owner, promoter and competitor Keith Haney, the Elite 16 brought together teams from at least four major drag racing series with just as many engine combinations for an exclusive end-of-season clash at the all-concrete Motorplex, one of the fastest tracks in the country. The weekend also featured the MWPMS World Finals, postponed by rain from a few weeks earlier in Tulsa, as well as a special Second-Chance Pro Mod race for Elite 16 non-qualifiers presented by Jerry Bickel Race Cars and the Summit Racing Equipment Top Sportsman class, pushing the total purse to more than $125,000. "Man, what an amazing event. Everyone had a great time, I know I did, we saw some very fast runs and our Mid-West Series guys showed everyone what they're made of," Haney said. "Pro Mod versus The World is what I call it. That's basically what it was and I was so happy to see Randy win; he's a great supporter of the series with his Twin Lakes Whitetails hunting ranch." "We also enjoyed the support of Elite Motorsports, Summit Racing, Jerry Bickel, Stroud Safety and Chilly Willys. I also think we learned a lot about what these cars are capable of when they're forced to run hard against each other. I mean, you had to go a 3.71 or better just to get into the Elite 16," Haney pointed out. "Nobody was pulling any punches and we saw that with a few failures when they pushed a little too hard, and of course the hotter weather favored the screw blowers some, but we still saw other combinations going fast, too. We even had Taylor Lastor show up with a radial-tire car and prove you could run 3.80s with it on a track prepped for Pro Mods. It really was just an amazing event." Top qualifying honors for the Elite 16 went to MWPMS regular Brandon Pesz with an outstanding 3.61-seconds pass at 208.75 mph in his screw-blown C1 Corvette. He was followed by newly crowned MWPMS Pro Mod champ Jonas Aleshire (3.62/208.84), 2018 NMCA Pro Mod champion Jason Hamstra (3.63/210.21), and Merick at 3.65 and 206.83 mph. 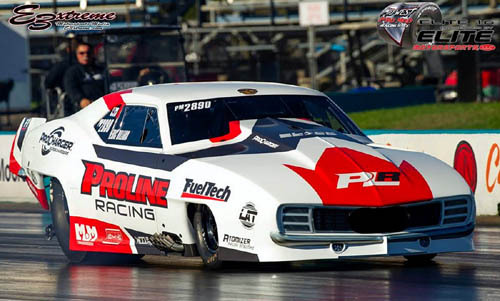 Other notables included Dillard in 10th at 3.67 and 201.67 mph with his Procharger-equipped '69 Camaro, Haney's nitrous-boosted 2016 Camaro 14th with a 3.70 run at 203.43 and "Turbo Todd" Moyer anchoring the field with a whopping 215.89-mph pass in 3.71 seconds. After dispatching Smith in the opening round of racing, Merick actually lost to a holeshot by Taylor in round two, but caught a huge break to advance, regardless. When his engine let go in a big way at the finish line, in a great show of sportsmanship Taylor immediately recognized any lost parts and fluids would put him below the 2,700-pound minimum weight so he bypassed the mandatory weigh-in, automatically handing the win over to Merick. "It seems like to win a race like this, you've gotta' have a break somewhere along the way and that was mine," Merick acknowledged. 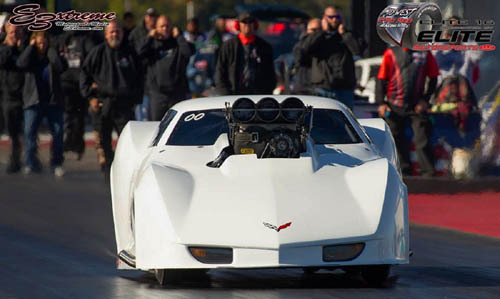 In the semi-finals, Merick faced off against the roots-blown, 2015 Corvette of Baker and after both drivers posted low .020 lights, Merick won with a 3.68 to Baker's 3.72 in the opposite lane. That pass also maintained lane choice for Merick, which he'd enjoyed all day and put him back in the left lane against Dillard, who beat Aaron Wells, Aleshire and Todd Martin with a 3.69 in the semis. The final round saw Merick leave with a slight advantage and never look back, running 3.67 seconds at just over 206 mph to beat a fading 3.73 at 197 mph by Dillard in his Georgia-based Camaro. "We had a boost leak and were down a couple of pounds of boost. That's why our mile an hour was down a little for the final," Dillard explained. "But we had fun. Really tight qualifying and everybody had to get up on the wheel when we were racing each other. It was a very, very competitive race." Merick said he knew he'd left with a good light and once his car carried its front wheels to halftrack, he felt very confident the rest of the ride. "I know when it sets the wheels down if they ain't in front of me by then it's pretty much over. I did look over a couple times and didn't see anything, so I just watched and waited for my win light to come on," he said. "And it did." After coasting through the long Motorplex shutdown area to a stop beside the track, Merick sat in the darkness for several minutes, waiting on his crew to arrive and contemplating the moment. He admitted to initially thinking of the sizable purse he'd just earned. "After I hit the chutes and shut down I did think to myself, 'You just won 50-thousand dollars!' There was a little talk beforehand about splitting money, but I've never split a purse in my life. If you're going to split the money, you might as well just load up and go back to the house," he stated. "I wouldn't split the money if I had the rods hanging out of it. Really what I would have liked to do was put all the money, winner and runner-up, in one purse and race for it all. "But more important than the 50 thousand dollars was to win the race," Merick quickly added. "I think they'll have plenty more of these Elite races. Keith (Haney) is a hell of a promoter and he'll keep it going and tweak on it, make it better, but this was the first one ever and there's only one first winner." Merick said his thoughts also turned to Tom Tutterow, ailing father of his engine builder and fellow racer Todd Tutterow, who left the track early Saturday morning and flew home to North Carolina. "You know, right before the quarter finals we found out that Tom was not doing good so I went and borrowed a marker and wrote his name on the back glass of my car. Right when I wrote that on there, I knew I was gonna' win the race," he said. "We did find out that Todd did get home in time. He texted me the next morning and said that his dad had passed. But he did get to have one last talk and one last laugh with him. That was very important to all of us and to Todd. Kind of a bittersweet deal." 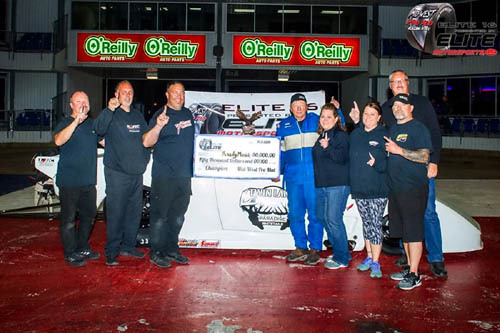 Also winning on Saturday night at the Motorplex was MWPMS regular Ron Muenks, who steered his nitrous-fed '68 Camaro to a final-round win over Jerry Hunt and his blown '67 Camaro in the $15,000 Second-Chance Pro Mod race presented by Jerry Bickel Race Cars. Additionally, in the final for Summit Racing Equipment Top Sportsman, Oklahoma's Kirk Piepke and his nitrous-breathing, late-model GTO defeated the blown 2018 Camaro of Darian Boesch. 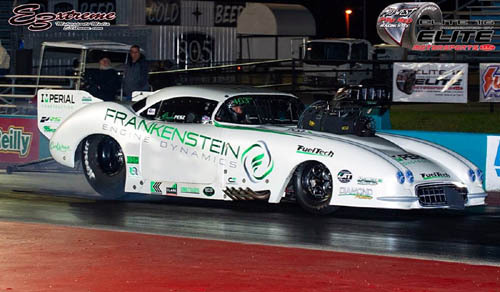 "I think the Elite 16 was a success and we achieved everything we were hoping for, especially for a first-time deal," Texas Motorplex General Manager Andy Carter concluded. "Of course there's always improvements to be made and hopefully we can get a little more help, sponsor wise, to make things bigger and better for everyone next year."